My family is a pretty big fan of Kalahari Resorts. It was the first of the major/big indoor waterpark hotels in Wisconsin Dells that The Man and I stayed at, many years ago. 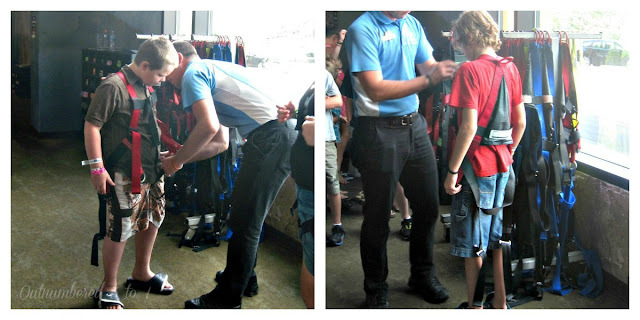 The kids got to experience Kalahari last year for the first time. It really is a world of wonder. Last month, our entire family visited again while on our honeymoon/family vacation. While we didn’t stay overnight this time, we sure did have a fun filled day! That’s the great things about Kalahari, you don’t have to spend the night to enjoy their water and theme parks. We got daily admission passes for the day and happened to have a blast! Since we had never been inside the indoor theme park before, we chose to do that first. The kids all went on the Ropes Course first and had a great time. They went 20 feet up and experienced 22 climbing elements. All of the boys went on the Ropes Course adventure. Getting through the entire thing took about 30-45 minutes. I watched safely from the bottom, snapping photos the whole time! No theme park would be complete without a Go Kart track and this oen just happens to be inside, elevated above the theme park! All of us went on the Go Karts and they sure were fun. They take your picture each time you pass and you can purchase them at the bottom of the steps when you get off the ride. I took this photo while The Man and I were on the Ferris Wheel. There was a Climbing Wall that everyone was super excited to climb. The oldest of my younger brothers climbed like a spider money and made it up in no time, just seconds longer than the record at the park! I snapped this shot, switched my camera to video and it was already too late because he was at the top! My boys tried it too and loved it! Of course they had some practice because their old school used to have one in the gym! 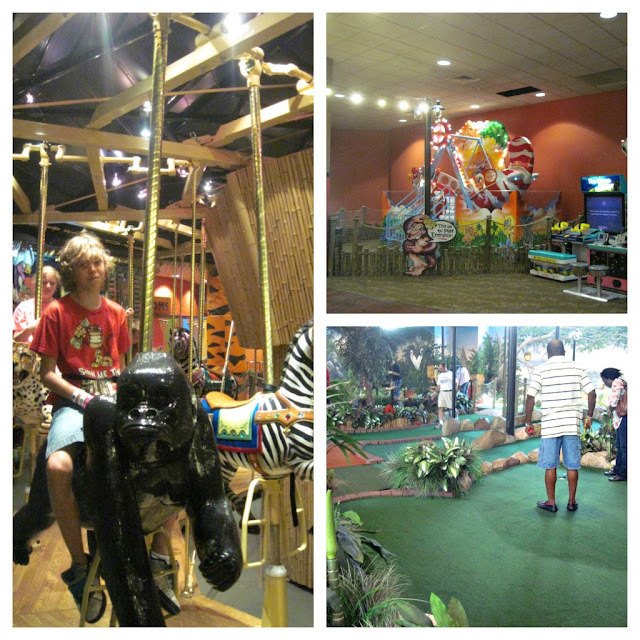 The indoor theme park at Kalahari has so many fun things to do including a carousel, mini golf, lazer tag,fun rides for the littler tots and so much more. 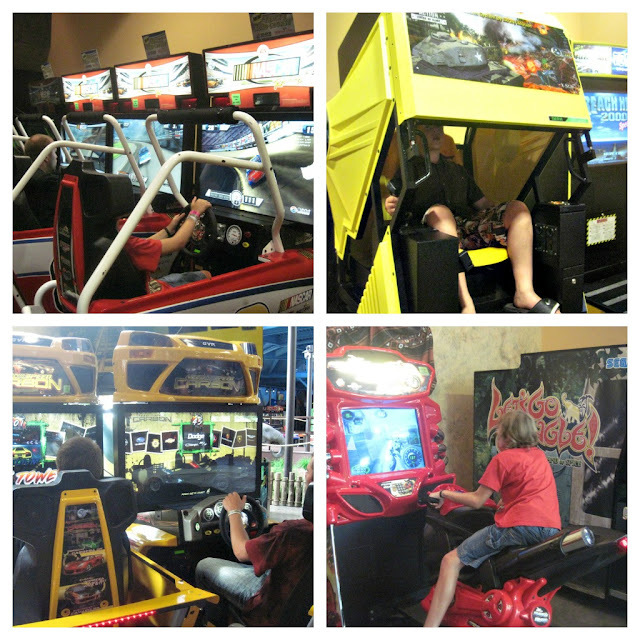 There’s even a full arcade with games galore, including the boys’ favorite, racing games! Since we did just leave an arcade before arriving at Kalahari, I didn’t let them focus too much on the arcade games though! The whole family had a lot of fun in the indoor theme park at Kalahari. We spent the better part of our day there as there was so much to do and it was our first time in the theme park. I thought is was nice that they had Crocs available for rides that you need shoes for. Since Kalahari is a resort with a waterpark, there were a lot of people barefoot and in sandals. It definitely saved Lil Man and I from having to pass on a few rides since we were both in sandals. 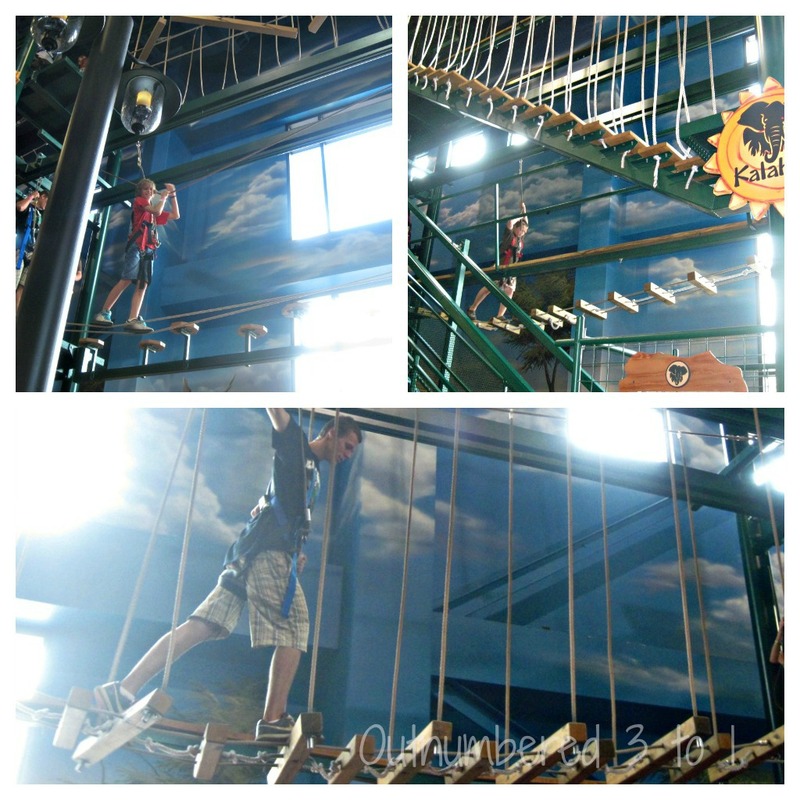 After our fun int he theme park, we decided to grab a snack, then hit up the indoor waterpark for a bit before we would venture on our journey home after a very long, fun filled week in Wisconsin Dells.As soon as we walked into the waterpark, we noticed some new water rides. The kids were all so excited that they ran up those stairs first thing, while The Man and I sat on the sidelines, watched and got some video footage of the new rides, Sahara Sidewinders and Screaming Hyena. And then we got suckered into going on ourselves! We went on the Sahara Sidewinders and let me tell you, that ride is intense! I love fun and adventure, even thrill rides, but I can’t say I’d do this ride again. Everyone else disagreed with me of course though and said it was an amazing rush! While it was a rush, I wasn’t prepared for my body to leave the slide or to hold my breath. The slide has water shooting all around, unlike a traditional waterslide, so I ended up with a lot of water in my nose and mouth since I didn’t think to hold my breath until it was already too late. After that fun, crazy adventure, the teens took off with my boys to ride some more slides while The Man and I waited endlessly for Master Blaster, my absolute favorite ride at Kalahari. We spent close to an hour in line, but it was well worth it. We had a great time playing at Kalahari on our last day in the Dells and will definitely go back again. We might just even stop in to play sometime when we’re driving through, instead of waiting until our next Wisconsin Dells vacation next year! Combo passes for the indoor waterpark and theme park are on sale starting at $39. We received day passes for Kalahari to facilitate this review. Opinions expressed are my own and my family’s and are not influenced by any form of compensation. Take it or leave it. 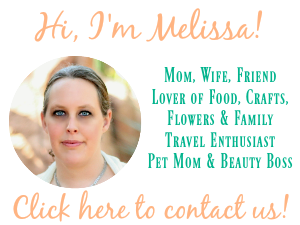 Click here to view my full acknowledgment policy.